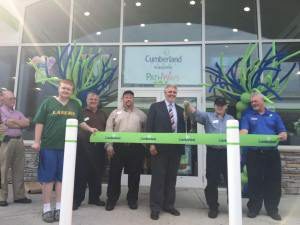 PathWays helps cut the ribbon at the new Cumberland Farms on Pleasant Street in Claremont! We are pleased to announce that Cumberland Farms is partnering with PathWays in celebration of the opening of their new store on 121 Pleasant Street in Claremont, NH. They will be donating 10 cents to PathWays for every beverage they dispense between September 8, 2015-October 6, 2015. 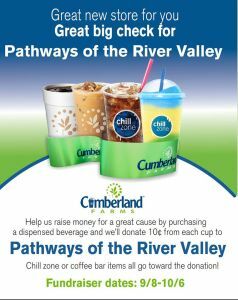 This Cumberland Farms Pathways fundraiser includes coffee, fountain sodas and slushies. Please join us for the Cumberland Farms Pathways fundraiser kickoff event at today at 2:00. Encourage your friends and family to grab their coffee or soft drinks at the new Cumberland Farms on Pleasant Street from September 8 through October 6! We want to thank Cumberland Farms for their support of PathWays! Please stop by to check out the new store and to show your support for PathWays.